The cultural consensus that surrounds a truly big event movie is inherently exciting. We live in an increasingly fractured and niche-oriented universe, but every once in a while a film comes along whose appeal transcends all demographics and barriers, a film everyone simply must see. The Avengers is such a film, as is its comic book peer The Dark Knight Rises. The Star Wars prequels were unusually pure examples of this curious breed, as was Avatar. But all these films pale in comparison to the greatest event movie of all time: The Itchy & Scratchy Movie. It’s difficult to watch “Itchy & Scratchy: The Movie” now and not think of another massive event movie from a little while back called The Simpsons Movie. Say what you will about The Simpsons Movie, it’s impossible to deny the culture-wide excitement that swept the country, and the world for that matter, when the film came out. Hell, I was borderline-ecstatic about the mere opportunity to buy Buzz Cola at 7-Eleven in connection with the film. When merchandising opportunities get people stoked, you know you’ve really tapped into something. Bart and Lisa are as excited to see The Itchy & Scratchy Movie as I was to finally experience The Simpsons Movie. For true believers, this no mere movie: it’s a major cultural event. Hell, it’s not much of an exaggeration to say that within the context of the episode, the movie isn’t just a major cultural event: it’s the major cultural event, the one that makes all the struggle and strain and joylessness of living not only bearable but worthwhile. Ah, but “Itchy & Scratchy: The Movie” isn’t initially focused on the seismic cinematic happening that gives the episode its title. No, the first two acts or so are primarily concerned with Bart being Bart, and causing responsible authority figures (and also Homer and Mrs. Krabappel) migraines in the process. Marge, meanwhile, is forced to suffer for her son’s sins. Marge’s sit-down with Krabappel resembles a conventional parent-teacher conference less than it does a war-crimes trial. A deeply traumatized Krabappel even refers to Bart’s actions as “atrocities” and trots out “witnesses” who can attest to his reign of terror. Krabappel doesn’t just want to talk to Marge: she wants vengeance, even if that means forcing Marge to write “I will try to raise a better child” over and over again on the chalkboard the same way she forces Bart to document his crimes at the beginning of every episode. Homer simply can’t punish Bart effectively. Bart is too devilishly clever and manipulative and Homer is just too gullible and easily manipulated. 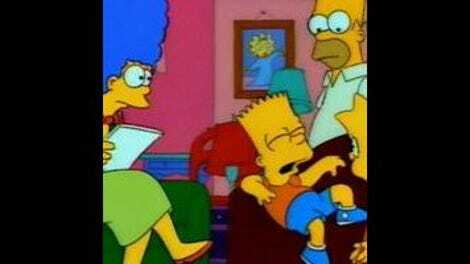 All Bart has to do is bat his eyes, adopt a hangdog expression or promise to be better and threats of punishment quickly gave way to offers of presents or ice cream. Finally, however, Bart goes too far even for Homer when he lets Maggie out of his sight and she ends up driving the family car into a prison. Then, one night, the family gathers to watch a news report chronicling the long, circuitous road Itchy and Scratchy traveled to cinematic glory. It’s an ingenious scene that combines smart, self-referential meta-comedy (like The Simpsons, The Itchy & Scratchy Movie is animated in Korea, albeit by what look like terrorized employees working in sweatshop conditions and being menaced by bayonet-wielding soldiers) with hilarious parodies of the early Mickey Mouse cartoon “Steamboat Willie”and the crude jingoism that characterized American cartoons at the height of World War II. This is Itchy & Scratchy we’re talking about, so everything is coated in blood and ridiculously over-the-top, like a scene of Itchy and Scratchy murdering Hitler together, after which Itchy reverts to character and murders Scratchy, at which point FDR shows up and proceeds to abuse the corpses of both Hitler and Scratchy. Homer is finally convinced that Bart must be punished and stumbles upon the ultimate punishment: Bart is forbidden from seeing The Itchy & Scratchy Movie. Bart is devastated but vows to use his imagination to help him dream up adventures even more exciting than the film he’s missing. Bart’s brain is warped by television, however, so the best he can manage is imagining Itchy and Scratchy standing there, waiting for further direction, before they finally give up. The relationship between Bart and an endlessly indulgent, forgiving Homer forms the heart of “Itchy & Scratchy: The Movie” so it’s appropriate, hilarious, and sweet that the episode ends by flashing ahead 40 years, to the halcyon day when Homer is finally able to watch the film with Bart, who has exceeded expectations by becoming a chief justice of the Supreme Court. All is forgiven and old slights are long forgotten as Homer and Bart bond over their shared conviction that Itchy is a jerk. “Itchy & Scratchy: The Movie” isn’t just funny and sweet: It’s also the definitive parody of event-movie mania, though it’s as much a loving tribute to the hubbub and frenzy surrounding a truly epic event movie as it is a spoof. Maggie hugging the airbag makes that sequence the most adorable car crash ever. The part where Kent Brockman says, “First, let’s take a look back at the year 1928, a year you might see Al Capone dancing the Charleston on top of a flagpole” is such a great, succinct comment on how newscasters and movies and TV rely on the same lazy clichés and touchstones and historical signifiers to provide context no matter how ridiculous or reductive they might be. I like that Homer was too busy rocking out to the bubblegum sounds of Ohio Express to watch the moon landing. “We’ll be back with a real-life Itchy and Scratchy: a rabid mouse in Boston who attacked and killed a small cat” Brockman recounts. Animal murder: not so funny in real life. Next up is “Marge Gets A Job.” If memory serves correctly, that’s a good one.